Spring 2019 Sessions open for registration ! Updated Tuesday April 9, 2019 by Steve Severn. AGSA is happy to offer the spring 2019 edition of focused clinics for pitchers and catchers. Each pitching session will be instructed by a pair of high level, current High School school pitchers from Wakefield, Yorktown, O'Connell and Robinson. *June 2nd is the single make-up date - this date will only be used in the event of the cancellation of a session due to inclement weather. If there are additional cancellations, they will not be made up. **Note there are no clinics on 4/14 or 4/21. Please note that each session is 45min and there is a 10min break in between sessions. 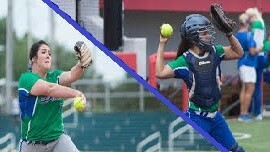 Pitching Clinics will be offered to players in 3rd grade and higher. There will be 6 weeks of instruction. Pitchers must bring an adult catcher with them. We have spots available for only 8 per session. Beginning sessions are designed to work with the players and introduce them to pitching form and mechanics. Intermediate/Advanced sessions are designed to work with pitchers with previous pitching experience and will focus on pitching fundamentals. All pitchers are expected to spend extended practice time on their own, in addition to attending these sessions. If your daughter is in 3rd or 4th grade and the winter pitching clinic was her first pitching clinic, please go ahead and sign up for the Beginner clinic. If your daughter has never pitched in a real game and probably wouldn't be competent pitching in a game this weekend, put her in the Beginner Session. CATCHING CLINICS: New Schedule posted April 9. This session will focus on basic catching skills such as blocking, framing, throwing and will provide an emphasis on solid techniques. Each session will be held on SUNDAYS at Tuckahoe Park Field #2 and is limited to 8 players. If girls have their own catching gear, they are asked to bring it or borrow the team’s gear- otherwise, bring a glove, comfortable shoes (cleats/sneakers), water and a positive attitude! *June 9th is the single make-up date - this date will only be used in the event of the cancellation of a session due to inclement weather. If there are additional cancellations, they will not be made up. Go to https://agsafastpitch.siplay.com (the home page) and you will see a button near the top of the page that says " Registration Now Open" Click there and you will be taken directly to the AGSA regisration site. Or you can just click on the green "Log-in" button at the top right of the page and it will take you to the same location. If this is the first time registering for AGSA, then you will first have to set up an account once landing on the registration page. REFUND POLICY: Spring 2019 Pitching and Catching Clinic: There will be NO REFUNDS for missed sessions.